A Friendly Phage – Doris Dawn – Mature Model. A bacteriophage /ˈbækˈtɪər.i.oʊˌfeɪdʒ/ (informally, phage /ˈfeɪdʒ/) is a virus that infects and replicates within a bacterium. The term is derived from “bacteria” and the Greek: φαγεῖν (phagein), “to devour”. Bacteriophages are composed of proteins that encapsulate a DNA or RNA genome, and may have relatively simple or elaborate structures. Their genomes may encode as few as four genes, and as many as hundreds of genes. Phages replicate within the bacterium following the injection of their genome into its cytoplasm. 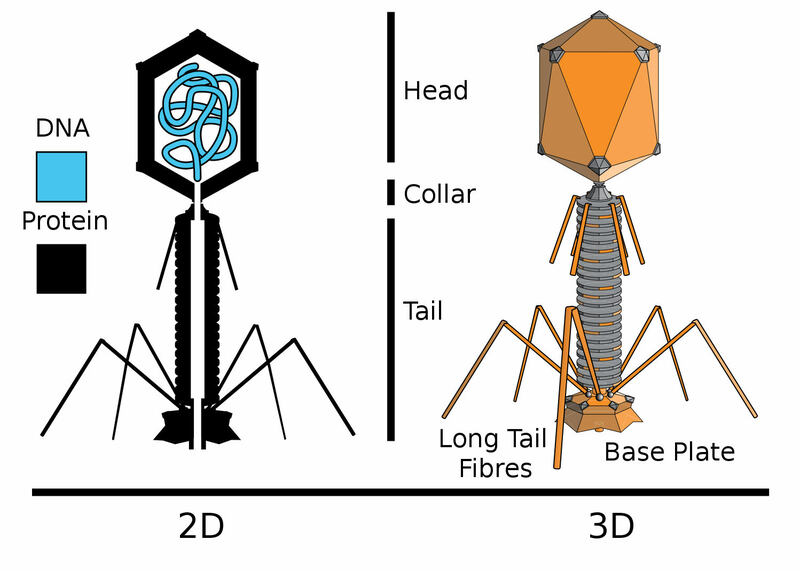 Bacteriophages are among the most common and diverse entities in the biosphere. Have a closer look at this little guy. Twice. Does it seem ‘evolutionary’ to you? Well, most likely that our planetary ecosystem has been properly configured to sustain and balance life. Long before we discovered the microscope. Long before we imagined – and then invented – devices capable to wipe out life completely for miles around, to poison the air and turn the terrain barren for centuries to come. Are we the first nuts trying to nuke our home planet? Or were there others, millennia before our modern times? Speculating on the theories from this episode (good to watch the entire episode after the scenes in the five minutes trailer), we may consider that yes! At least once, some nuts – earthlings or extraterrestrials, or both together – have succeeded to nuke this planet, in parts. What if ancient earth looked like Jupiter’s satellite Europa? More or less. Having a canopy of water, perhaps crystallized up to an icy crust on the outskirts, and warmed down to rain drops on the inside. Not as thick as to form an upper ocean, yet compact and thin enough to blanket the entire atmosphere below. A worldwide cloud filtering sunlight. A friendlier environment with less sunburn, allowing people like Methuselah to live well beyond nine hundred years (there were other factors involved, such as genetics, but pollution and irradiation cannot be removed from consideration, even if marginal). What if the fathers of the Nephilim have been fecundating daughters of men in places far away from the Biblical lands? What if “Shiva the Destroyer” had harnessed nuclear energy, both for peaceful and for military purposes? Evidence of an atomic blast, that occurred some 4,000 years ago, can be found at Mohenjo-daro in Indus valley. The mainstream calls this ‘sudden decline.’ What if Mohenjo-daro went into ‘sudden decline’ like Nagasaki? Oh well, you are entitled to ask yourself, what could be the connection between bacteriophage viruses and a water canopy wrapping earth and nuclear warfare upon the Indus valley some four thousand years ago? And where are the nudes, for goodness sake? No nudes in this post! Because this topic is about life and death, about why no life can come out of death – as life comes only out of Life. Back to the speculation now. Four thousand years ago, give or take, the earth suffered a great flood. Did it affect the entire planet? For sure. Did it cover all land? As in waters rising above the Everest? Or a few peaks escaped? Maybe. Were there any survivors, other than the ones who traveled in Noah’s Ark? Most likely. How did they survive the global calamity? By hiding in secret underground waterproof tunnels and cities? In caves on heights above water levels? The Hebrew word ‘erets’ from Genesis 7 means ‘earth’ or ‘land.’ It can indicate the entire planet but it also can refer only to a certain territory – a vast land for certain. But then Genesis 7:19 makes it unequivocal: “And the waters prevailed more and more on the earth and were covered all the hills high that [were]under the whole heaven.” The word ‘kol’ – whole, all – changes the perspective. As seen from heaven, beneath all of it, everything has been covered by waters. But I digress. The deluge didn’t eradicate life entirely, but – as a natural phenomenon – it just filtered it out at different levels: marine life versus dry land life. The Ever-Living offered Noah a solid way of survival. Then other engineers – in the know – crafted their own strategies, for better or for worse. And some even managed to escape. Out of commodity, we’d like to think that God would always have a plan for us, an immanent and very material and prosperous plan, at least as solid as the blueprints He has given Noah. In reverse, when something goes south, we incline to believe [based on the same assumptions] that God gets angry at us and He won’t spare a moment [what’s that a moment, by the way] to rain hell on earth, to terminate and destroy everything in the way. Is God a dictator? Is God a maniac? Does He wants us [sinners] to live or to die? Assuming that you know the rational and literal answers to these questions, here are a couple of calming examples: The Ever-Living agrees with Moses not to erase Israel after flagrant and repeated mutinies; He allows a moderate decline of Canaan before Joshua’s armies; sending Prophets to be ridiculed and murdered, He is centuries-long patient, first allowing a gradual decadence of Northern Israel [by her own wits] then even more patient before the utter fall of Jerusalem and the ensuing Babylonian exile; then He uses the Persian kings to restore Israel, only to eventually allow Himself to be judged by envy, exchanged in politics and crucified to death [thus erasing death]. This God loves us and loves life because He made us and created life. He is life. Only life. Other gods, or extraterrestrials, aliens, etc. [as they go by many names], epigones or imitators, they have to destroy what they didn’t make, only to care for building up anew. They cannot create out of nothing, so they need ashes. No ruins, no creation. No desolation, no development. No war, no peace. This cycle of life and death has no beginning and no ending – said the epigones. So the cycle justifies the means. What if these other gods were allowed to develop their technologies only as means of trial for those belonging to God? What if God didn’t push a button to start the great flood, but instead patiently observed the nuclear tensions building up in the Indus valley, anticipating that those fools eventually will press the red button? Posted in Reflections, SchoolingTagged best listener, Psychic barrierBookmark the permalink. Pingback: Discard Your Daemons – Doris Dawn – Mature Model.